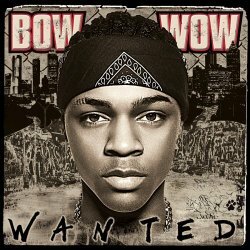 Bow Wow (formerly Lil' Bow Wow, born Shad Gregory Moss on born March 9, 1987 in Columbus, Ohio), is an African American rapper. Releasing his first album, Beware of Dog, at the age of thirteen, Bow Wow quickly became a successful recording artist, under the mentorship of record producer Jermaine Dupri, eventually breaking out on his own by 2003 and continuing his success. Moss never saw his biological father and was raised, along with his stepsister Erica, by his mother and her husband. When Moss was five, he started his career in rap using the monicker Kid Gangsta. One year later, he took front stage during the Chronic tour and impressed rapper Snoop Doggy Dogg who would later give Moss his first professional alias, "Lil Bow Wow". Dogg later hired him as an opening act and introduced him to Jermaine Dupri, a producer who helped shape Moss' career. He backed up the success of his 2000 debut album, Beware of Dog, with 2001's Doggy Bag, which contained songs such as "Thank You" and "Take You Home". He was Punk'd by Ashton Kutcher for losing some borrowed jewelry.